Commandant Gen. Jim Amos’ trip to Afghanistan through the Thanksgiving holiday has brought a little reported Marine Corps mission to the forefront: village stability operations. Associated Press reporter Bob Burns was along for the trip, and outlined in some detail what operators with Marine Corps Forces Special Operations Command are doing in Puzeh, a dusty village in Helmand province about 10 miles south of the Kajaki Dam. In September, I discussed the MARSOC village stability operations mission with Maj. Gen. John Toolan, the top U.S. commander in southwestern Afghanistan. Instead of being involved in raids or other high-profile spec-ops missions, the MARSOC Marines who perform village stability operations are called in to small villages where Marine commanders see potential for progress, even if there isn’t a full established Marine presence, he said. Toolan said there are three MARSOC teams performing village stability operations. Over time, their mission may evolve. 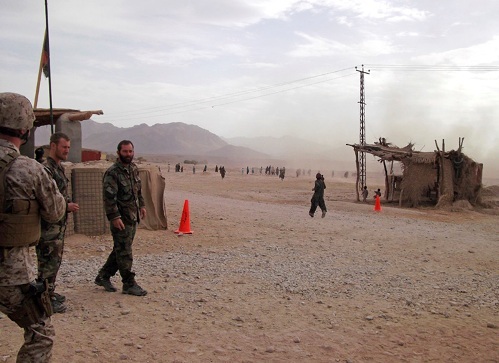 Other MARSOC operators are based in western Afghanistan, primarily in Farah province.